Catamount is a luxurious, five-bedroom house built into a hillside of boulders and bright Western wildflowers, surrounded by trees and the high Wyoming mountains. Its big, paneled front door opens onto a quiet Granite Ridge cul-de-sac – and from there it is just a short distance to Grand Teton National Park and the ski lifts or the shops and restaurants in Teton Village including the Four Seasons hotel, where sushi and cocktails await. Catamount is a marvelous, hospitable vacation home, completely in accord with the mountain landscape all around, its log frame and peaked roofs brushed by high pine boughs. Inside there are five distinctive, comfortable bedrooms, five and a half bathrooms, and every modern convenience. Mountainscapes and framed photos hang on the walls. Throughout the day, golden light fills Catamount’s high-ceilinged rooms, and there is a constant feeling of alpine spaciousness and peace. Just up a light-filled staircase from the entryway, the great room is divided by back-to-back river stone fireplaces that stretch up to cathedral ceilings. Tall windows frame the trees outside – seasonal art in themselves, ablaze with color in fall or garlanded in snow. French doors open to an outdoor living area with willow chairs, a dining table and the fresh balsam air of the forest. Next to the dining room, there is a sunroom where the flowered hillside fills the high windows like a painting; and outside, a hot tub on its own private deck. Catamount is as suited for relaxing after a day of skiing or hiking as it is for high-style entertaining. Full sets of table linens, china, crystal and elegant flatware are at hand, and the dining room table will easily seat eight with three additional seats at the adjacent bar. With its big gas stove, Sub Zero fridge, granite countertops and array of gourmet cooking equipment, this luxury Jackson Hole rental property can accommodate cooking enthusiasts or a professional chef. The room has an open layout and a bar that make meal preparation easy and communal. Just beyond the kitchen is a deck with a gas grill for cooking in the open air. The second floor also holds the house’s two biggest bedrooms, both with rough-hewn, log frame king beds and vaulted ceilings. Each has a private bath, and door which opens onto the great, wide balcony. A very large, well-equipped laundry room is also on this level, and everywhere you turn there are quiet alcoves with game tables, comfortable chairs, and reading lights. A balcony under the eaves sits just above the front door. Three more bedrooms stand on the first floor. Two bedrooms have charming, rustic bunk beds fitted in crisp linens. One has a queen bed at the bottom, another has an extra twin bed off to the side, so each room could comfortably sleep three tired adventurers. The final guest room on the first floor has two log twin beds, standing side by side and an en-suite bath. Catamount’s first floor is where guests will find some of the home’s great diversions: a game room with foosball and air hockey tables, lots of board games, and a giant framed poster of the Jackson Hole downhill ski trials, just to whet the appetite. Steps away, a comfy television and media nook. A great, stone-floored mudroom with ample shelving is ready to store boots, skis and snowshoes, and from there the back door opens onto the vast Wyoming wilderness. 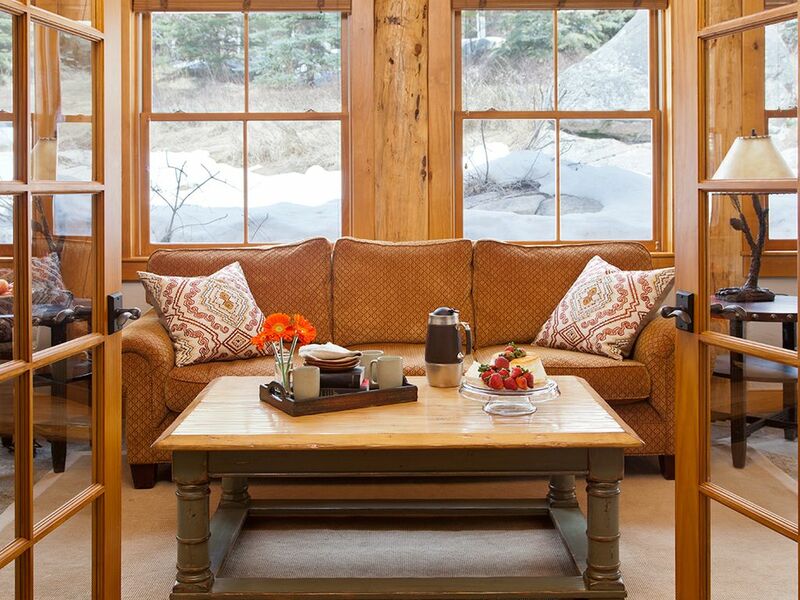 Catamount is a charming, personal, and welcoming house that feels very much like home. Catamount is a beautiful home for a large family. We had ten adults and three young grandchildren in the home. The layout of the home permits privacy for all families. It's in a convenient location adjacent to the main village. The property is well-maintained and contains all of the items a guest would want including outdoor furniture, outdoor heater, barbecue, etc. The only negatives were that is wasn't sufficiently stocked with supplies (no kitchen towels) and insufficient items for a large family such as tissues, toilet paper, soap, etc. It seemed the company was skimping on supplies for some reason. At the rate we paid for the house, it seemed odd. The management company was very responsive when we asked for additional supplies. The wax the cleaners use on the floor is exceedingly slippery. Both children and adults were slipping on the hardwood floors throughout the week. In summary, I'd highly recommend it, with those few reservations. Spacious, quiet and private for 11 of our family; Surrounded by aspens, wildflowers and NO PEOPLE OR CONDOS; Well-stocked kitchen with bar and table areas; High quality linens. Our grandchildren made great use of the hot tub and massive sectional sofa. Easy walking distance to Teton Village. All in all, a grand experience at the Catamount. The house was beautiful - lovely patio areas, spacious bedrooms and lots of room to have your own space. We loved it! The best vacation house ever! We gathered 3 generations in this wonderful house for a family vacation. Its spaciousness and multiple gathering areas made it ideal for 12 active people. Janet met us at the house when we arrived and answered all of our questions. She also made some wonderful suggestions, such as the local swimming hole! We all enjoyed the steam room, hot tub, multiple porches and game room. We had some minor problems but the property manager was very responsive. The only negative was the old dishwasher which doesn't hold dishes for 12. My Bosch at home holds up to 24 place settings. The location is excellent as it is quite private and easily accessible to Jackson and the Tetons. A little longer to Yellowstone, but doable.